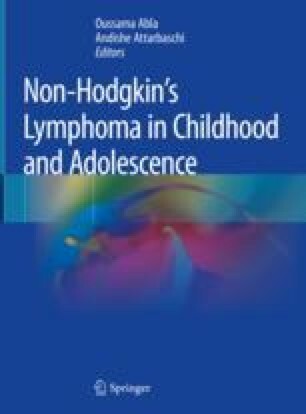 Non-anaplastic peripheral T-cell lymphoma (PTCL) is a heterogenous group of disorders comprising about 1% of non-Hodgkin lymphoma (NHL) in children and adolescents. Most common subtypes are peripheral T-cell lymphoma not otherwise specified (PTCL-NOS) followed by NK−/T-cell lymphoma (NKTCL), hepatosplenic T-cell lymphoma (HSTCL), and subcutaneous panniculitis-like T-cell lymphoma (SPLTCL). Prognosis of PTCL in children and adolescents is worse than for other childhood NHLs with 5-y EFS around 50% and 5-y OS around 55% but still better than in adults. Survival rates are subtype-specific and best for SPLTCL, intermediate for PTCL-NOS and NKTCL, and worse for HSTCL, requiring subtype-oriented treatment approaches. We thank Wolfram Klapper, M.D. and Rex K.H. Au-Yeung, M.D. for providing the histological pictures.